Enjoy crisp, hassle-free ironing thanks to this cordless multifunction iron. Free from the hassle of standard corded irons, the Kogan 2200W Cordless Iron will have you spending less time ironing and more time doing the things you actually enjoy. Heating up in under a minute, the powerful 2200W element will flatten out those difficult creases that just don’t seem to budge. Containing a large 240ml water tank, the fine mist spray will keep all of your shirts, skirts and pants feeling fresh and crisp. If your iron runs out of battery while it’s in use, then all you’ll need to do is plug in the lengthy cable to finish what you started. Even better, the 360 degree design of the cable ensures that you’ll never have to iron on a tough angle again. This iron easily locks into its base station, making it simple to carry around at any moment. Slotting perfectly into any cupboard thanks to its sleek design, the Kogan 2200W Cordless Iron is essential for every home! The iron’s nifty charging dock makes efficient cordless ironing even easier. Simply pop the iron back on the charging dock after every few ironing strokes for a powerful, energy efficient ironing experience. Enjoy the freedom of ironing without the restriction of a power cord. The charging station makes efficient ironing easier and more convenient. Use the adjustable heat settings option to ensure your clothes are never ruined with excessive heat. 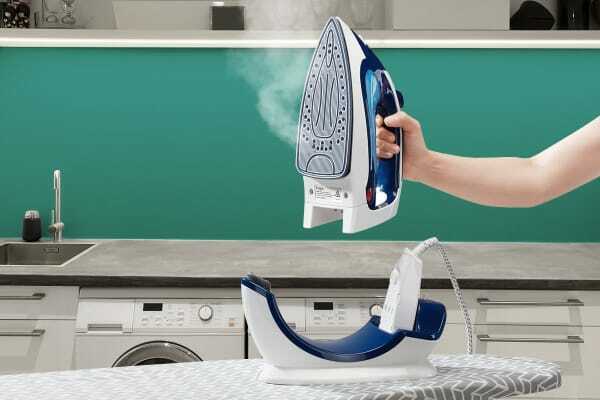 Experience the range of ironing modes with this handy cordless iron. Use the burst, dry, spraying and steaming features to remove the most stubborn of creases. Heating up in under a minute, the powerful 2200W element will flatten out those difficult creases that just don’t seem to budge. Easy to use and cordless. - color choices would be nice :). Excellent multi option iron. Seems to be excessive water leakage while steaming. I like this but hard to convince my cousins from the overseas to use it & put away their reservations of ignorance..
Good iron but when fill with water, it leaks onto clothes while ironing, but love the cordless feature so easy to iron.